Each controller operates two signals, one in each direction, or two heads on a multi-headed mast. The system is bi-directional on single track. Signals perform exactly like prototype ABS (Automatic Block Signal) signals. CTC (Centralized Traffic Control) features may be added. For example, a SPDT switch added to the dispatcher’s panel would enable him to set all eastbound signals red between two points during a westbound train movement. 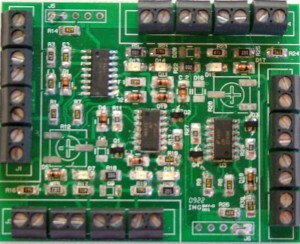 Controllers feature printed circuit boards with surface mount industrial-grade electronic components. Wires are inserted into screw terminals for connections. No soldering is required. On-board LED’s reflect the aspects of the signals and allow troubleshooting any wiring errors without having to look at the signals themselves. Controllers require a Block Occupancy Detector to “notify” the controller if the block is occupied. The MOD-4 Controller is a 12 volt system that will supply two signal heads with up to three LEDs “on” at a time if they are wired in series, ie. PRR signals. The values of the current-limiting resistors are changed to accommodate the number of LEDs. The MOD-5 Controller is specifically designed for the SA type searchlight signal using one bi-color LED. It features trim pots to achieve the color of yellow to suit your taste. Both signal controllers provide a positive voltage to the LEDs in our signal heads. The LED cathodes are connected to the common (-) terminal. The signal system is independent of the track power. All signal controllers are available assembled.